Musings 'n scribblings of a philanthrope .. : Zero Mass - water harvesting from Air ..
With the recent revelation by an American media company and verified by WHO, that bottled water across the world have micro plastic particles in it ranging from 20 micro particles per litre to as much as 3000 micro particles per litre, the situation is really serious and needs urgent attention from water specialists and public health officials from around the world. Can you use a solar panel in combination with material science technology to absorb water from air ? Well that is Prof. Cody's invention, from Material Science Dept of Arizona State University. He has developed this panel, named SOURCE, that costs about $2000 and can harvest about 2-5 litres of water daily from air. 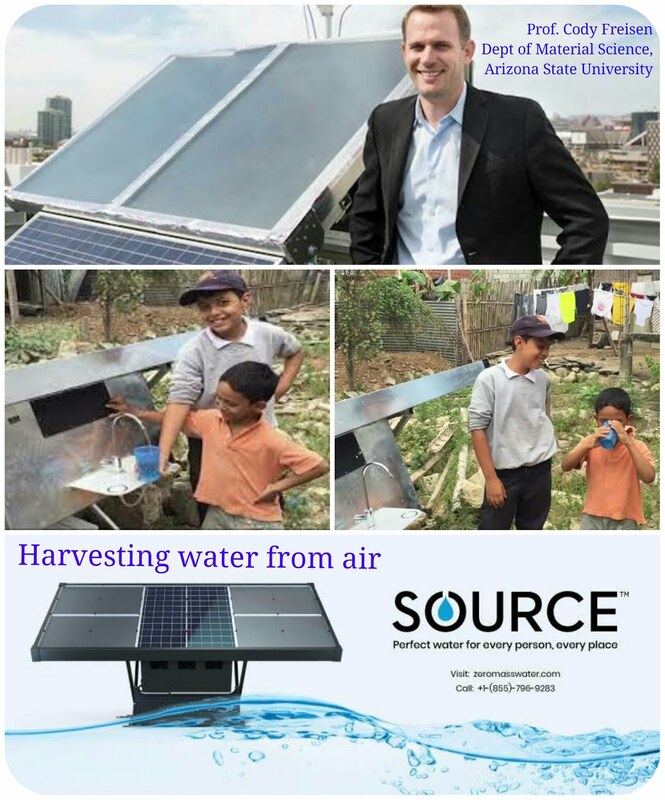 By using a combination of water absorbing chemicals that absorb water from the atmosphere and harvesting this water out of the chemicals and suitably mineralising it, Prof. Cody is able to bring potable water from thin air. Click here for the news item from The Verge ..
Click here for the youtube video .. Presently the panels are deployed in water starved areas in South America and Syria and in some affluent homes on an experimental basis.. This invention / innovation has the capability of solving the water crisis of the world. If the technology is made more accessible for the people across the world and the technology is patented and handed over to innovators, we can definitely see great cost reduction and wide spread usage for this technology to solve the drinking water crisis of the world. Some questions we look forward to getting answered in the coming years or even months..
1. Can this technology be scaled up to extract thousands or millions of litres of water from moist air ? 2. What will be the final cost per litre of water then ? 3. Can suitable technology be developed across the world that can help generate even non-potable water in large volumes to meet the common needs of humans and industries ? Lets hope the coming years will help see an end to the water crisis across the world.